From left are Chad Mason with Clinton County Juvenile Court Probation, New Vienna Lions Club President Brad Hughes, and Clinton County Farm Bureau President Kym Parks. The Clinton County Farm Bureau recently received a generous donation from the New Vienna Lions Club. This donation will go to the Clinton County Farm Bureau’s “Pennies for Piggies” project to benefit the Friends of the Clinton County Juvenile Court. The money will be used to continue their work with at-risk youth to raise livestock projects through the local 4-H program. “We love seeing this community come together to help these kids. 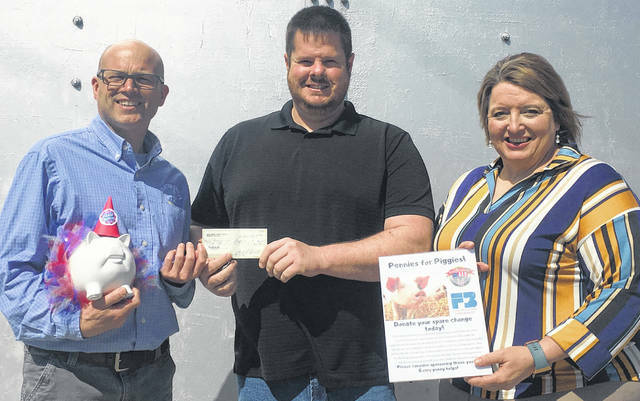 Everyone has a little pocket change they can give to help us make a big change in the lives of these kids,” said Ashley Rose, the organization director of the Clinton County Farm Bureau. Currently there are seven businesses in Clinton County that have a piggy bank that you can drop your spare change in. The locations are Buckley Brothers, First State Bank, Bush Auto Place, Qualitee, Merchants National Bank, the Clinton County Ag Society, and the Clinton County Farm Bureau office. If you have a local business and would like to sponsor a pig to put up in your business, please call the Farm Bureau office at 937-382-4407 for more information. Clinton County Farm Bureau is a grassroots membership organization that works hard to advance agriculture and rural communities. To learn more about the Clinton County Farm Bureau, visit its website at ​https://ofbf.org/counties/clinton/​ or follow it on Facebook and Instagram by checking out Clinton, Fayette, and Greene County Farm Bureaus.